I have been obsessed with tomatoes this Summer. I found a booth at the Farmer’s Market and the guy has like 20 different varieties of heirloom tomatoes. I have loved trying them all. I have not found one heirloom varietal I don’t like. 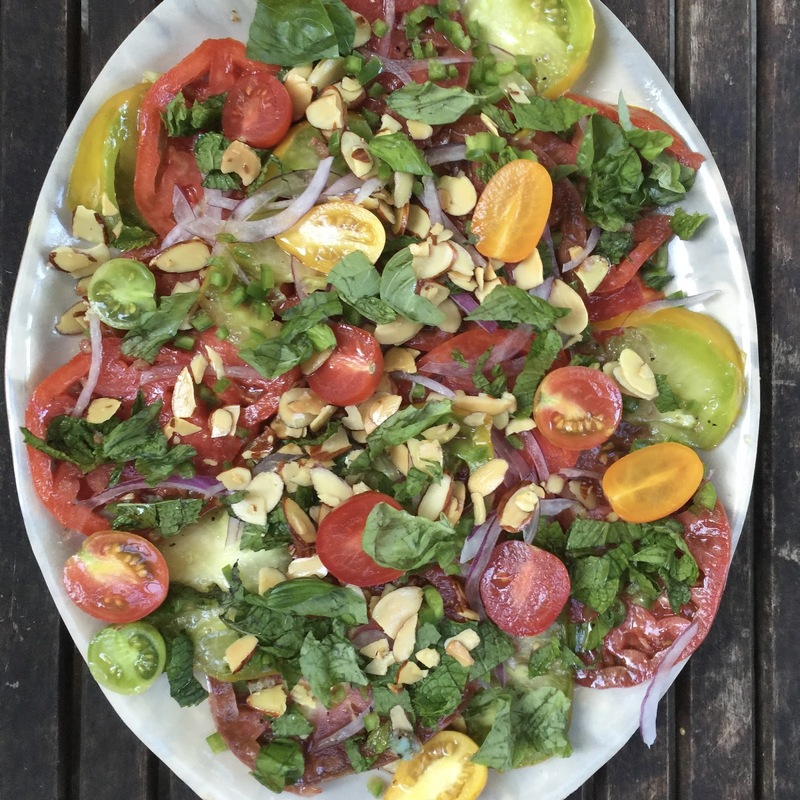 This salad can be made with any tomatoes but I like using the heirlooms because the colors are so vibrant and gorgeous. The dressing and fried almonds take this salad to whole new level. That combined with the ripe tomatoes and fresh herbs make for one amazing salad. I also learned something new from this recipe, that soaking onions in ice cold water makes them not as strong. A trick I will be using often because sometimes they can be over powering and if you soak them they are not. This salad is a must try this Summer. Just try not and eat the whole platter, I had a hard time restraining myself! In a medium skillet, cook the almonds in oil over low heat stirring occasionally until slightly browned. Strain the oil through a fine sieve into a bowl. Lay the almonds on a paper towel and sprinkle with salt. Immediately whisk the garlic into the warm oil and let cool slightly. Then whisk in lime juice, red wine vinegar, and sugar. Season with salt and pepper. Spread the tomatoes on a baking sheet or paper towel and sprinkle with salt. Let stand 5 minutes. Drain the soaked onions and pat dry. Scatter half the almonds on a platter then top with tomatoes. Drizzle with the dressing and top with onion, jalapeno, mint, basil and remaining almonds. 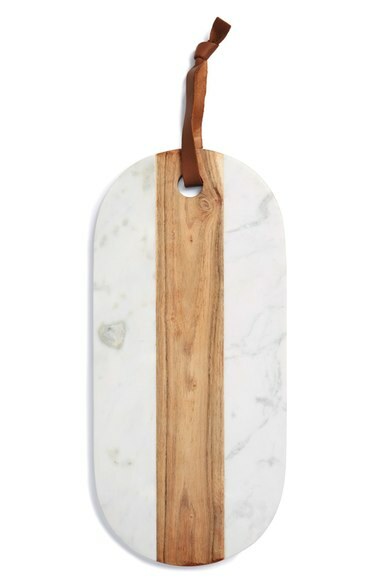 I finally had some time to peruse the Nordstrom home sale selection. There are some really great deals still left. This sale ends August 8th, so only a few days to shop. I love this round wooden board for entertaining. It is the perfect size for a small happy hour nibble. It also comes in a long oval version. These make such great gifts at around $25 a piece. 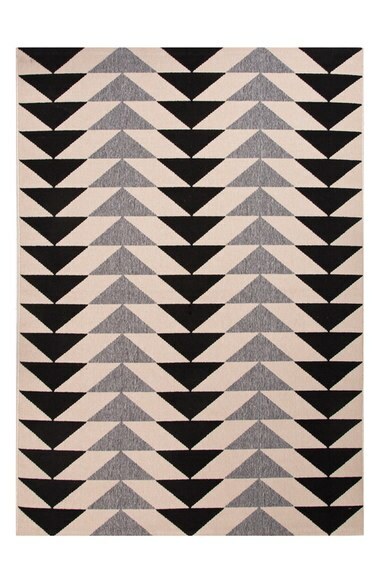 We have this indoor/outdoor rug in Sterling’s room and it is the best. Easy to clean because you know how messy boys can be! Last Night I had Supper Club with a few of my best girlfriends. This dress is an oldie but a goodie 3 years later. I bought this before I had Frances Moon and still love it. It is also a great non-maternity, maternity dress because it is so loose. I wore it often while I was pregnant with Frances and then passed it along to my sister and sister-in-law to borrow while they were pregnant. Now it is back to me and I am loving it for the Summer. It is super light weight and airy, perfect for these hot days we keep having. It is under $100 and comes in 15 color options. Sizing wise it runs TTS, I am in a size 4. I also had a few questions about what bra I wear with this dress and I wear this one, it is nice because it has no back. You can also wear a regular strapless one you just have to make sure the back is pulled down so it doesn’t show. This style is my go-to regular strapless bra.